DAVE MAHON, the stepfather of missing teenager Amy Fitzpatrick, has been formally charged with murdering her brother Dean. Mahon, 43, met gardai at Coolock Garda station, as arranged, at 9:26 this morning. He was charged with murder at 9:40 by Sergeant Michael Gormley, to which he made no reply. He then appeared in Dublin District Court and was remanded in custody by Judge Cormac Dunne. Dean, a father himself, died from a stab wound in May last year, sustained during an altercation with Mahon in his Dublin flat. He had allegedly gone to confront Mahon over the disappearance of his sister Amy on New Year’s Day 2008. The judge granted legal aid after Mahon’s solicitor Michael Staines stated his client was on disability allowance. He could not apply for bail as this can only be granted by a High Court for a murder charge. Mahon waved to partner Audrey Fitzpatrick as he entered the court, who sat in the public gallery throughout the morning’s proceedings. He yesterday vowed to fight the murder charge and has always claimed he stabbed Dean in ‘self-defence’. “I’m not guilty of murder, not murder, Jesus no,” he told the Irish Star. Mahon will most likely be held at Cloverhill remand prison in Dublin. Read the Olive Press’ exclusive investigation into new evidence regarding the possible burial site of Amy Fitzpatrick and the night she disappeared. See the walking stick was back in evidence . Why is this man getting disability , he props up bars every night with that old scut ….. The olive press always say he is an estate agent …. Please don’t say he is a benefit fraudster as well . I wonder where all those donations went ….. Kletos or highlander bar ?….. I have a funny feeling that the Amy mystery will begin to unravel …. Disabled??? disability allowance?? more like beer tokens, I hope the mother is charged as well, disgusting behaviour for a mother, putting drink and a scumbag before her own children, there is a lot of questions that need answering, for the fathers peace of mind, lets hope justice is served on this disgusting pair, of parasites. Forget about Deans case for a moment. Just suppose amy makes it home on that new years at 10-30 by all coounts audrey and mahon arrive around the same time. Both pissed as one would expect after a party but they must have been pretty bad as Audrey could not even make to bed she claims. Now what if amy who was left to fend for her self while the mother and mahon were haveing a great time at the party? do you think Amy would be happy? I think a row broke out and mahon or audery killed amy and mahon who we know has no problem driving while drunk to get rid of her body. By all rights amy had cause to be full of anger as the tickets for the plain home were already paid for by a family member. 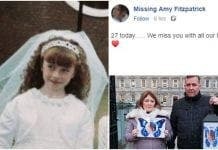 She was on a promise she would would be going home to Ireland to live with her dad so any anger amy might have had could be accounted for. hypothetical situation of course but none the less worth thinking about. Audery and Dave both are known for tellig lies …worth thinking about -just look at mahon no sign of remorse. Hey Lou Lou – Justice for the Fitzpatrick family at last! Wonder how Mahon’s first night in Prison is going for him ……! And what on earth will SHE be doing without him joined at her hip! Hopefully a High Court bid for bail will be denied – or else I’d say they will flee. Raggy – I also wondered about that. Every report says he’s ‘living in Spain’, and ALSO that he got Legal Aid today because is in receipt of Social Welfare in Ireland for disability – a public announcement of Welfare Fraud ..? Strange that while he has been living in Spain there was no sign of the walking stick! I agree with Lou Lou in that the Amy mystery will now start to unravel…..
@goldstar , partial justice only for the moment ,but at least it’s a start! The authorities should look at how they manage to live so well on disability surely their respective finances should come under scrutiny . without Mahon by her side maybe Audrey could confirm the lifestyles and reasons for both her and her children , most women put their children before any relationship , she to my reading put her boyfriend above her children. Amy’s lifestyle is for certain the reason she disappeared ,the bigger question is why was she living like this . It is very sad the whole thing. Watched him on Irish TV. limping with his “cane” into court yesterday morning before they charged him. Absolutely no sign of it when he was here in Spain, none whatsoever, no limp, no walking stick in tow when he was living it up in a bar on the beach on New Years Day, dancing, singing, cracking jokes….also the anniversary of Amys disappearance, he didn’t look like he was remembering Amy. Audrey wasn’t to be seen, but may have been in hospital. Well they don’t serve alcohol in prison as far as I know! Something he is very fond of, and finds the money for it would seem every day, disability allowance, or no disability allowance. Funny how he could claim disability allowance in Ireland, but live in Spain for the past few months? How does that one work then? From the photo shown, I feel sorry for Amy’s Mother and Step-Father.. they look terribly upset about latest charge. Possibly not as sad as Dean who was stabbed , murdered and buried and will never see his son grow up ! But your correct , how horrid for them to finally have to maybe face justice. I think the body language between the pair of them was very strained from that video footage on the news reports – does anyone agree? And Audrey’s response to the reporters outside the police station seemed rehearsed to my mind ….! The bail hearing, if it is applied for, should be denied! 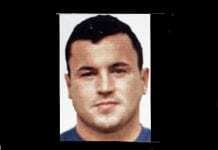 It will be granted Goldstar , he has “behaved”stayed in contact with the police and returned to Ireland on demand . I agree with you , this man should not be freed on bail but the system is the system . @Goldstar yes possibly strained, but only because they both knew it was the end of the road for them. They have a co-dependent relationship, drinking partners etc. They both looked like they knew what was in store for him. The cane business is what gets me!! are you for real the best of Spain? shocked at the latest charge? what do you expect? What about deans baby boy having no father to bring him up? what about deans dad who has lost his son and daughter? these are the people who should have our sympathy, not these two!